Welcome to the New Years Eve edition of Prepaid Phone News' Prepaid Phones on Sale this Week feature. Here are the best current deals on prepaid and unlocked phones that I've been able to find online and in stores. This week's Deal of the Week is the Cricket Huawei Elate 16 GB LTE Android phone for $64.99 at Best Buy and Walmart. The phone runs the Android Nougat OS. It has a Snapdragon 435 SOC, 2 GB RAM, 16 GB internal memory, SD Card slot, 5.5 inch 1280 x 720 px screen, non-removable 4000 mAh battery, and 12 MP main and 8 MP front facing cameras. It supports support the following bands: GSM 850/900/1800/1900; HSPA 850/1700/1900/2100; LTE 2, 4, 5, 12, 30. The Elate is locked to Cricket. There don't seem to be any 3rd party unlocks available for it. 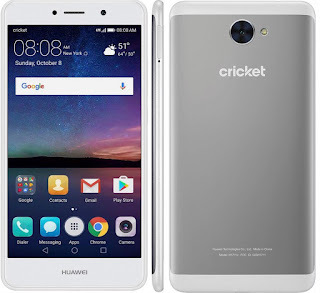 If you act really fast you can still get it unlocked for free immediately by Cricket by putting it on the $60 Unlimited Plan. To qualify for the immediate free unlock, the phone must be purchased by January 3. Phones purchased after the 3rd have to be active on Cricket for six months before they can be unlocked for free by Cricket. Another option is the Huawei Ascend XT2 which is AT&T Prepaid's version of the Elate, with identical specs. The Ascend XT2 isn't any easier to unlock than the Elate, but it will work without unlocking on AT&T Prepaid and postpaid or any AT&T MVNO. The Ascend XT2, which has a $119 list price is on sale for $89 at Walmart. 4 Lines of $50 Unlimited Gigs Plan for $100 ($110 with Todo Mexico) Family plan promotion. New activations only, at least one line must be a port-in from a non-Sprint based MVNO or operator. 4 or fewer lines $100, 5 lines $130. Ends 1/29. Verizon (or Verizon MVNO) Samsung Galaxy Note 4 N910V LTE Android phone (manufacturer refurbished) $139.95 Free shipping. Verizon (or Verizon MVNO) Samsung Galaxy S5 G900V LTE Android phone (new) $179.95 Free shipping. TracFone Samsung Galaxy Luna (Verizon) triple-minute LTE Android phone with 1200 minutes, texts and MBs of data, one year of service, case and car charger $99.95 (reg $79.99 w/o airtime) $6.95 shipping. TracFone LG Sunset (AT&T) triple-minute LTE Android phone with 1200 minutes, texts and MBs of data, one year of service, case and car charger $99.95 (reg $99.99 w/o airtime) $6.95 shipping. TracFone Samsung Galaxy J7 Sky Pro (Verizon) 16 GB LTE Android phone with 1200 minutes, texts and MBs of data, one year of service, case and car charger $179.95 (reg $149.99 w/o airtime) $6.95 shipping. Free Phones for port-ins: The Alcatel Fierce A30, Coolpad Defiant, LG Aristo, LG K20 Plus, Motorola Moto E4, Samsung Galaxy J3 Prime, Samsung Galaxy J7 Prime, ZTE Blade Z Max or ZTE Avid TRIO are free when you port your number that's not currently active on T-Mobile network to MetroPCS. In stores only. hi Dennis, wishing you and yours a happy new year's. also, would you explain the difference between boosts 4 lines for 100 vs 5 lines? thanks. the huawei elate/ascend-xt2 is a great phone, but so long as you do NOT fill up and overload the phone with apps and if you have all your data, photos, videos, music go on a SD card. you can set the storage location to the SD card, but cannot set up the phone for installing apps on the SD card. if you can afford it, you can put a 128gb microSD card on the phone. expect bloatware but you may be able to delete some of them. You're bad for my wallet. I've purchased five phones, this year, that appeared in this weekly roundup. Last week I snagged the $79 G4 Play, from B&H, and put it on the free 1-year unlimited Sprint plan. I'm covered up in phones and it's all your fault, Dennis. Lol same here, I have too much airtime also, all overlapping, time for gifting. At least most are Sim cards. True!! These deals are too tempting to let go, got a couple on FP, Ting and a handful sitting in boxes or unlocked. You'ze guyz is screwin' wit Dennis' phone stats! Stop buying so many. LOL! "AT&T Prepaid ZTE Blade Spark 16 GB LTE Android phone $79.99 (reg $99.99) at Best Buy"
From reading about this phone there was a problem with the screen going black and apparently your callers can't hear you most of the time, but like most phones under $100, no follow-up if an update fixed the screen issue. This phone gets horrible reviews, not sure if it's been updated or if that's even capable of fixing it. 2 people I know have this phone and are satisfied with it, Maybe they have updated firmware . It's easy to find "terrible reviews" of ANY cellphone. If you believe them, you would never buy a cellphone. Cellphones are not all perfect, and some people write revenge reviews that are not true for a variety of reasons. The one year warranty protects you from defects for a long time - most problems will show up within one year. If you don't accept normal risks, buy an extended warranty. I'm taking about the overall reviews, not cherry picking a few. CNET reviewed the Blade Spark and praised it. Unlock code is $1.79 on eBay. Horrible speaker and microphone, you can barely hear the caller and they can barely hear you. When I click on the 99c FreedomPop LTE data-only SIM it says free with free shipping. Do they charge 99c for activation or something? Yes there's a 99¢ activation fee. Interesting. Then it would seem the 1cent phone SIM is a better deal. Get more, pay less? Huawei Ascend XT2 is selling New on eBay for $75 from various sellers. Doesnt the ascend xt have a better processor than the xt2? Not really. The XT has a Snapdragon 616, the XT2 a Snapdragon 435. While 616 sounds better than 435, the 616 is an older model and CPU performance keeps increasing, so a newer 400 series SOC could have equal or better performance than an older 600 series. .
NotebookCheck ran over a dozen benchmarks on each SOC and concluded that the two had equal overall performance. However, they didn't run the same versions of several benchmarks on both processors possibly skewing the results.